In essence, nightcrawlers like Louis Bloom (Jake Gyllenhaal) aren't terribly different from the paparazzi who stalk and photograph people of fame, the only real difference being the publicized "celebrity" they hope to capture and sell to the highest bidder. Their target just happens to be an abstract concept rather than a physical specimen, aiming to shoot the most unsettling depictions of gory and/or shocking events so that news stations can amplify their significance on their next broadcast. Violence continues to be a commodity in this sensationalist culture of ours, whether it's in fiction or real-life, and the speed in which news travels further rewards the gumption required to capture these morally icky pieces of footage. Dan Gilroy's haunting pseudo-thriller Nightcrawler isn't purely interested in the mentality of those involved with this line of business, but of a desperate individual like Bloom with the temperament to thrive in that environment when they can't elsewhere, blurring the line between capitalism and sociopathy. We first see the eloquent, piercing-eyed Louis scraping by to survive in Los Angeles by selling illegally-obtained piecemeal metal to local construction sites, an unsettling parallel to the profession he'll soon become embroiled in. One the way home one evening, he catches glimpse of a camera operator videotaping a fiery car accident (instead of helping), sparking his curiosity into the possibilities of what that job entails. With his work prospects looking slimmer, Louis throws himself headlong into the business of being a "nightcrawler", acquiring the basic tools needed to conduct the job -- a police scanner, a camera, a navigator (Riz Ahmed) -- and learning what makes footage valuable. Getting the recording is only part of the equation, though: he also must get it to a seller as quickly as possible, thus forcing him to network and negotiate with a news-channel producer like Nina (Rene Russo). The ethical boundaries of the job might wear on some, but Louis' personality seems tailor-made to tiptoe those ambiguous lines. Writer/director Gilroy, who spent time with real-life nightcrawlers to get a grasp on what their work really entails, carefully introduces Louis by illustrating his willingness to cross boundaries, masquerading his sociopathic tendencies as cool, articulate pragmatism. Much of this emerges in his verbalized dialogue with other people, expressing his philosophies on life -- "A friend is a gift you give yourself. "; "Why you pursue something is as important as what you pursue." -- in the same way that internal commentary delivers insights to the audience, making his stances during conversations a tad incongruous and on-the-nose in expressing who is and what he's about. There's a trade-off, though, in exploring the mesmerizing state of mind that drives Louis Bloom's deviance without the ease of inner monologues: watching the metamorphosis of his moral grayness becomes an unrefined introduction to what he's capable of, feeling more as if Gilroy's showing rather than merely telling. Jake Gyllenhaal has portrayed mentally unstable characters before, from a hallucinating teenager passionate about time-travel to a disturbed marine recruit and an obsessive homicide detective, yet none of them approach the depth of psychosis to that of Louis Bloom. Shedding nearly thirty pounds in body weight to convey the mania and sleeplessness of the character, he telegraphs a subtly fearsome performances through gaunt features and bugged-out eyes, calmly articulating Louis' methods and motivations in a compellingly no-nonsense fashion. Gyllenhaal's performance works so well because he makes that heartless candor appear so genuine and practical, revealing how Louis is capable of doing a job reliant on an absence of empathy, a sharp portrayal of a functioning psychopath who's found a way to channel his clinical persona into something lucrative. His work ethic and skill of verbal manipulation generate complex responses from his colleagues, whether it's his navigator teammate or the ethically-pliable news producer who buys his footage, and the performances never lose sight of the veracity of Bloom's persuasiveness. 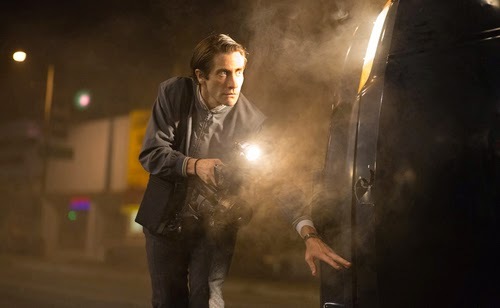 At first, Nightcrawler feels more like a novel character examination that's content in simply riding the momentum of Bloom's climb up the seedy rungs, zipping through the darkened streets of L.A. hunting for prime stories in a warped success story. The workings of his self-possessed derangement might have run out of steam later on, though, without the right openings for his warped perspective to interact with real-world normalcy. Lo and behold, the beginning merely acclimates the audience to his moral fabric so they'll understand how he conducts himself when confronted with true opportunity, how he capitalizes on, even shapes, the circumstances for his benefit. Director Gilroy enters an unpredictable world once Bloom happens upon a situation beyond the depth of those with journalistic integrity, transforming the story into an excruciatingly thrilling experience complete with frenetic car chases -- including brilliant usage of a Dodge Challenger -- and livewire anticipation during a few truly unforeseeable stakeouts, photographed with mood and authenticity by action-thriller vet Robert Elswit. There are gaps in logic built around Bloom's ability to slither away from culpability for the things he does, the ethical and legal boundaries broken to develop his prestige, but Nightcrawler's observations on entrepreneurship and the manipulation of media tend to offset those quandaries. Director Gilroy doesn't aim to preach with the content, letting the news-channel's exploitation of Bloom's footage convey its own points about the economics and veracity of sensationalism ... and the necessity of people like Bloom to escalate it. Cynicism isn't in short supply as the story takes shape, either, but that's a big part of what distinguishes this dirty neo-noir portrait: its willingness to follow Bloom into warped, dark places just to see how he gets what he wants, matching the bloodshed and misery of others with his devilish grin as he forks over everything needed to perpetuate fear in others. It's an uncompromising outlook on society, and Bloom's inability to compromise makes for an absorbing hard-boiled thriller.